We are very pleased to announce that the Down Hill Strugglers has a song on the soundtrack to the new film by the Coen Brothers, "Inside Llewyn Davis." Its track #8 on the soundtrack album, a great old folk song called "The Roving Gambler" that we first recorded a couple of years ago for our Folkways record. We are joined on this song by our great friend, mentor and ofttimes bandmate John Cohen (of the New Lost City Ramblers). The film is really good. It's set in the Greenwich Village folk music scene in 1961 and is loosely based on parts of the autobiography of the great folk and blues singer Dave van Ronk. (If you look closely in the film you can see a photograph of our bandmate Jackson Lynch hanging on the wall in the background of a scene in a music promoters office!) Its great to see the Coen Brothers do another folk music based movie as a kind of followup to "Oh Brother Where Art Thou?" although the films are very different. We are honored that our song was included on this collection, which is set for release on Nov. 11th. The film itself comes out in mid December. Other musicians on the album include the amazing and versatile Punch Brothers, Marcus Mumford (without his Sons) and noted folk singer Justin Timberlake. The album was recorded and produced by T Bone Burnett. More information is available at the Nonesuch Records website. If you are interested in what's going on in the New York City folk music scene today, the heart of the scene is centered at the Jalopy Theatre in Brooklyn. Come down on a Wednesday night for the "Roots n Ruckus" show. Its free, they pass the hat for the musicians. Its the best place to see the current folk music scene at work. 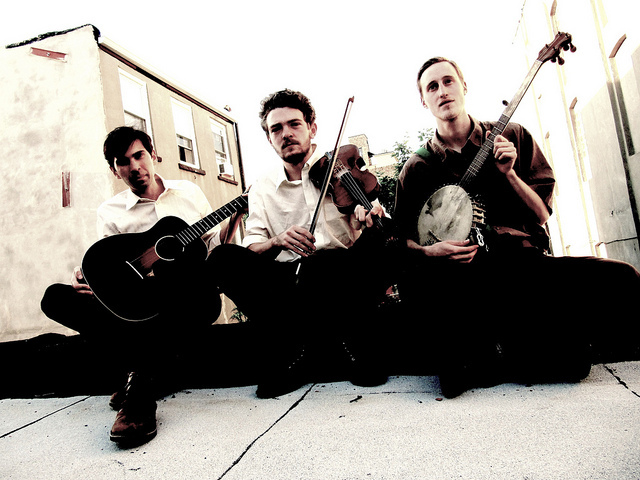 Also check out the Brooklyn Folk Festival and Washington Square Park Folk Festival, both organized by Down Hill Strugglers band member Eli Smith. Here is a very nice article from the "Brooklyn Based" blog about Down Hill Struggler Eli Smith. Please visit their website, brooklynbased.com for the complete article including all links, audio, etc. It seems like 31-year-old banjo player Eli Smith was destined to play old-time folk music. He grew up in Greenwich Village–the epicenter of the 1960s folk revival boom. His parents–who are left-wing political activists–exposed him to the folk sounds of giants like Woody Guthrie and Pete Seeger. But it wasn’t until he listened to music by the likes of bluesman Mississippi John Hurt and The New Lost City Ramblers, an old-time string band, as a teenager that he started to seek the sources behind that old-time roots sound. Smith is one of the members of the Brooklyn old-time string group, the Down Hill Strugglers, along with fellow multi-instrumentalists Walker Shepard and Jackson Lynch. Formerly known as the Dust Busters, the Down Hill Strugglers perform traditional authentic roots music. Their latest album, Show Me the Way To Go Home, was released in October; and their performance of the traditional folk tune, “The Roving Gambler,” appears on the soundtrack of the new Joel and Ethan Coen film, Inside Llewyn Davis.